IF you still haven't watched Jon Stewart's recent interview of Mad Money host Jim Cramer, I suggest you do so. It is possibly the best piece of financial journalism thus far, on the financial meltdown in the U.S., and to think it was courtesy of a comedian. The full episode is available on The Daily Show web site. Since the subprime credit mess took its toll on the U.S. economy, comedian Jon Stewart has been taking potshots at CNBC and other similar financial news organizations for their lapses in reporting the true state of major financial institutions. 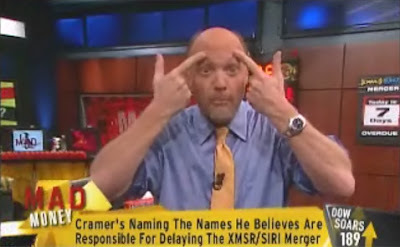 Jim Cramer, a former journalist, lawyer, and hedge fund manager, is a class A1 entertainer. He jumps around the set, makes funny faces and loud gestures, but basically only knows how to give bad financial advice to televiewers. On the other hand, he personally benefits by issuing stock analyses to 'Money Honey' Maria Bartiromo. Tsk, tsk. An indictment of Cramer's shoddy activities in The Gawker. Let's see how long CNBC will keep this joker around. UPDATE: Similarly, Ben Cohen of The Daily Banter rages against the Money Honey on HuffPost.